Really, Google? I know you have become the authority in English grammar recently. Everyone simply types a string of words and whatever you reply to them, they accept them as solid truth. Now, do you imply that “pair are” is more appropriate than “pair is”? I rephrase my query: do you mean ‘pair is’ is wrong? And ‘pair are’, correct? Because if your answer is ‘yes’, this also means “these pair” is more adequate than “this pair”. Grammar Conscious: What should I use to refer to apples, fewer or less? Descriptivist: According to the language database, many speakers used these words interchangeably without causing any misunderstanding. Prescriptivist: Fewer is the comparative form of few so fewer is used before countable plural nouns. An apple is a noun that can be counted so you should use fewer to refer to its plural form (apples). Grammar cops are obviously ‘prescriptivists’ – and perhaps I’m like one. Grammar was my first love. I thought becoming friends with it meant I’d be forever free from any embarrassment. I was enamoured by the authority Grammar bestows. I’ll never feel awkward speaking English as long as I know the norm. “Because” is now an acceptable preposition. It surely has an immense effect on all Grammar textbooks ever published. Oh how many of them now require revision! 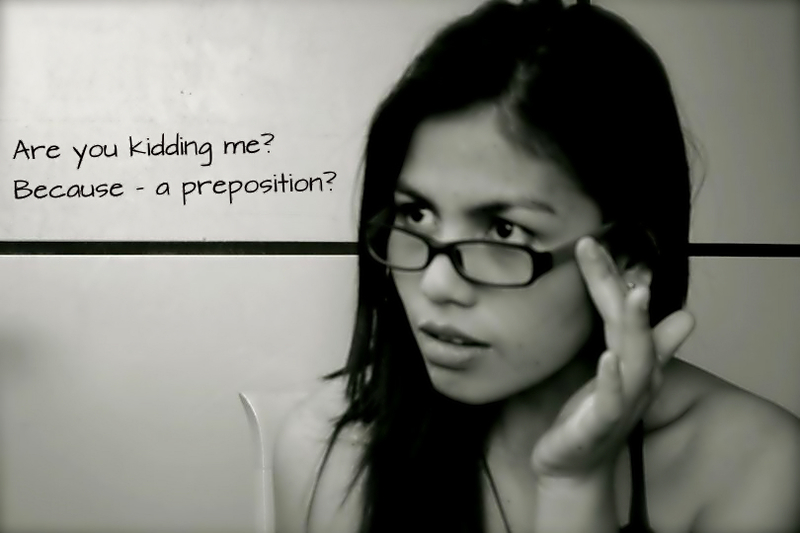 So should you be a descriptivist or a prescriptivist? Or both? After all, these two approaches in linguistics are meant to be complementary, not contradictory. Descriptivists paint the inherent chaos in a language, while prescriptivists put in order those causing language troubles or confusion through a set of commandments called Grammar. *Maxie is the name I gave to my laptop – please get used to me giving inanimate object a persona.